This camera is the only corded option that’s truly waterproof, and it provides 24/7 recording and crystal-clear 1080p images. I personally use one to monitor my backyard and the inside of my garage. The ability to set up different zones means I know where movement is coming from before I even pull up the video. Optionally you can have the camera's arm and disarm based on the geolocation of your cell phone as well. Who this is for: People who want to keep tabs on welcome or unwelcome guests on the front porch, back deck, garage, pool area, driveway, or anywhere else outside. The Good: With the Nest, you get 24/7 recording in crystal-clear 1080p, rather than just clips of action. The camera sends smartphone push alerts and keeps a detailed in-app timeline when motion occurs. 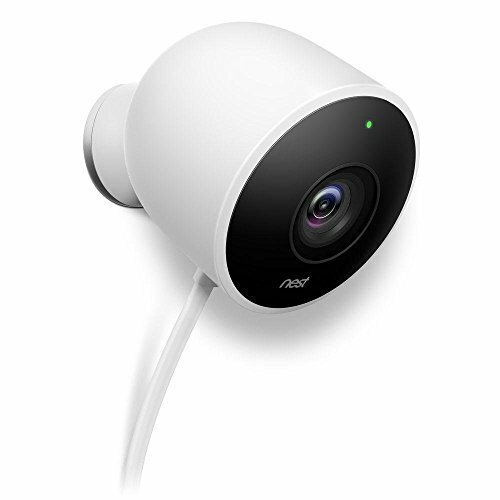 More importantly, the Nest Cam Outdoor is the only camera we’ve found that’s completely waterproof, which includes the power cord and adapter. That means it can withstand the outdoor elements a lot longer than you can. It requires the Nest Aware subscription service if you want to view your footage. The bad: Without the Nest Aware subscription service, this outdoor camera is basically limited to live viewing, so expect to pay a minimum of $5 per month on top of the purchase price. Also, if you don’t want to run wires or have an outdoor outlet nearby, placement will be limited. Who this is for: People who don’t have an outdoor outlet or want maximum flexibility when placing an outdoor camera. The Good: The Netgear Arlo Pro 2’s cord-free design includes a rechargeable long-life battery and can be placed up to 300 feet away from the Arlo Base Station. The system features a loud 100 dB siren and comes with seven days of free cloud storage (with the option to purchase more). If you prefer to store content locally, just plug an external drive into the USB port on the Base Station. The Bad: Because it’s battery-powered, it can’t record continuous motion. That means once a clip has been captured, there’s a reset period of a few seconds before the next bit of action is captured. This doorbell camera can capture a few seconds of action before the actual ring happens. It also has great motion detection and no subscription fee. Who this is for: People who want a permanently installed way to screen visitors at the door, whether they’re on the other side of the door or the other side of the world. The good: SkyBell HD has the most reliable motion-detection sensor of any of the models we tested. It not only catches people at the door but has a feature that can record a few seconds before the actual arrival, so you never have to guess who it was based on someone’s back. SkyBell also doesn’t charge you anything for video streaming or storage. It works with Alexa, SmartThings, Nest, and IFTTT. The bad: The system needs about 30 seconds to reset, so party guests and trick-or-treaters may have to wait. Also, even though multiple users can access the same doorbell, only one can answer the door at a time.